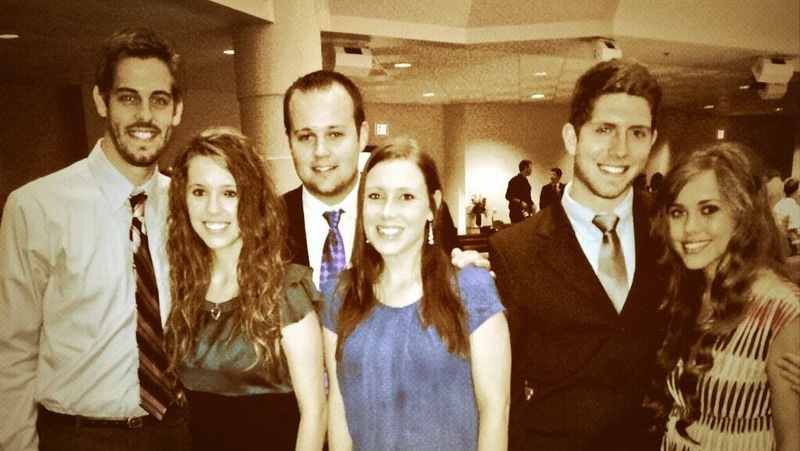 The Duggars are in Tennessee for Alyssa Bates' wedding this weekend. John and Alyssa, now Mr. and Mrs. Webster, tied the knot this afternoon in Knoxville. Cute pic!! I saw a video and a pic on Josh's instagram.. love the video!! I agree!! I think they all will! Oh wow! That sure went by fast! Had no Idea they were getting married that quick! Notice that Jill and Jessa are wearing nice dresses but at Erin's wedding they were wearing just a skirt and a shirt like they do any day? I'm a true fan for the Duggars wish one day I can meet them, im for sure inspired by them. Great pic. The next wedding coming up: Jill and Derick!!! Congratulations to Alyssa and John Webster!!! I can't wait til Jill gets married. Ben may need to get over his awkwardness before Jess agrees to marry him. Does anyone know why Jill went from courting to engaged quicker than Jess? Just curious because Jessa was all into her relationship/courting long before Jill even MET Derrick. No ill will intended just wondering. Thanks! My guess is because Jill and Derick are older and more ready to marry. Also they had been texting and video chatting for a while before announcing their courtship so it seemed soon to everyone but it was a while of talking first. Also Jessa is 21 which is how old josh and Anna were, but she has said that she is a more cautious person and wants to take it very slowly. Also, Ben is only 18 or 19 now so I think they're waiting a little so he's old enough to be ready to propose and be a mature young man. Hope this helps! Anyone know why Jill moved from courting to engaged so quickly while Jessa was already in her courting relationship longer? Just curious. Thanks! what kind of work does Ben Seawald do? what kind of job does derrick hold. it seems that these questions are not addressed at all on the show? the viewers would like to know? as a parenet i would question this things. Yes they seem like Godly men but what about supporting a family? and are these girls ready to be moms yet. Terra Moore: I think Jill and Derick are just ready. Derick has a degree and is 25. Jill is 23 and just about done with midwifery training. I think Derick and Jill are ready financially and are both mature. Ben is 18 (maybe 19 now) and first year college. I'm thinking Ben will wait to propose until he has a job that can support a wife and family. Anonymous 6: If you watched "A Duggar says Yes" he does auto glass as a job. Let me just say congrats to Alyssa and John Webster !!! @Terra Moore Might have something to do with the fact that both of them are older than Ben and Jessa. Ben is only 19 and Derick is 24, finished college and is in Seminary. I love watching the show it shows me how to act through hard times. Thanks! I love this pic. Jessa hair is so pretty.There all so lovely.Thanks!!! Both Jana and John David are muh more quiet and shy than Josh, Jill, and Jessa. This could be a reason that their two younger sisters have entered courtships and marriage before them. Also, they are only 24. Outside a family like the Duggars, most people are getting their first job or starting grad school and are nowhere near emotionally or financially ready to be married. Jana and John David just may not be ready yet. But I don't think at all that there is any type of Big reason or anything. Also Jana has likely gotten quite comfortable and settled and happy with her longtime role as second mom as far as jobs and helping around the house since she's the oldest girl, and she's probably nervous to leave, like a lot of people are when they leave home. This is such a nice show. I would like to court as well!! I do have one question, how do you go from not being romantically involved at all to just jumping right into it and figuring everything out once you get married? I guess it seems to work, I just have never seen it before. I completely agree with you. I don't know why but I always thought Jessa was so pretty and her and Ben are going to make a great couple and have marvelous looking children. love this pic great look all around wonderful people!!! Jessa is GORGEOUS! Ben is HOT! Wow! Such a great couple! Hope they get married soon! I wonder what her wedding colors will be? I hope Jana gets a guy soon! She is so sweet she deserves a good guy! Love love love!!!!! Love the dugger family.have watched it for several years.So excited to see jessa wedding! !